Rivers are nearly everywhere in the United States. We often see them while crossing bridges and we know that there is moving water there, but where is all that water coming from and where is it going? Rivers are formed by a watershed. 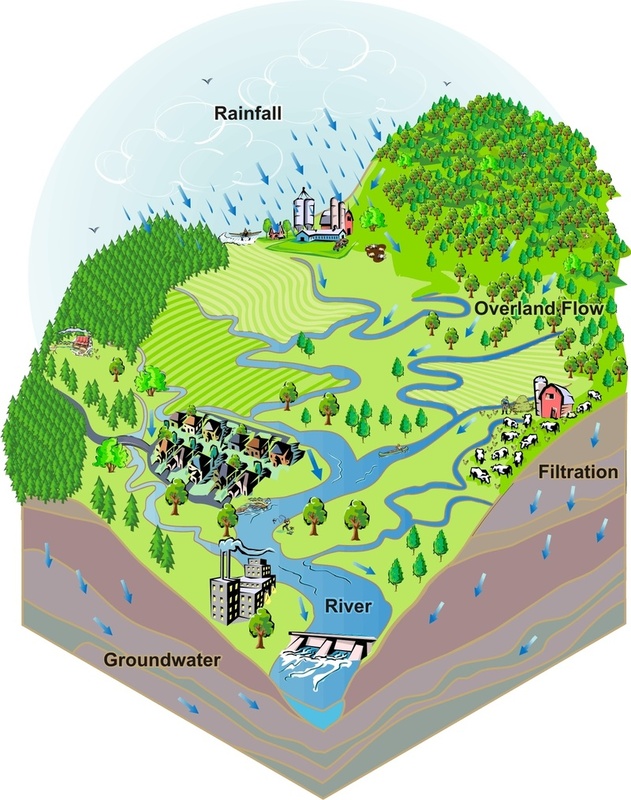 A watershed is an area of land where rainwater flows into valleys forming streams. These streams flow into other steams and eventually form a main stream or river. Some rivers form from an overflow of a lake like the mighty Mississippi River that begins at Lake Itasca, Minnesota. As the illustration at left shows, the rain falls and collects in the valley, then the water usually flows on to other rivers and eventually to the sea. After the water reaches the sea, some of it evaporates and forms clouds. These clouds drift over the land and release rain back into the watershed. This is the cycle of water. Some may ask, "What happens if it doesn't rain for a long time?" That is a good question because we will still see water flowing in the river, even during droughts. The answer is groundwater. When the river level gets low the water that is in the ground seeps into the riverbed and helps to keep the river flowing, even though it will be much lower than normal. 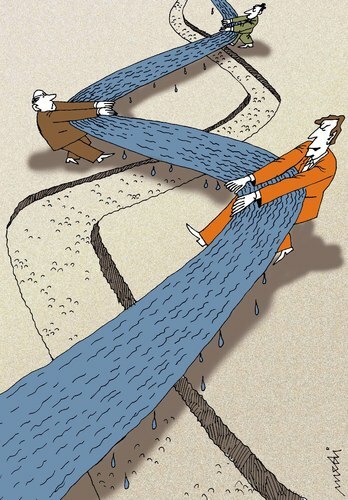 A divide is high ground or mountains that cause the beginning of streams to flow in different directions. The direction of a river flow is powered by gravity. Let's look at the Rocky Mountain Range. All the rain fall and snow melt on the easterly side of the mountains will flow downhill toward the east and the rainfall and snow melt on the westerly side of the mountain will flow downhill toward the west. The peak of these mountains is the divide between river systems. This mountain range is called the Continental Divide but there are smaller divides throughout the country where streams form. Shown is a divide in western Ohio that is only about six feet higher ground than the three rivers that form there. The beginning of a river is called the headwaters. How far does a river go? Most rivers are a connection to the rest of the world! Not only rivers but even the tiny steams that flow into the rivers are part of a huge watery route that leads to many far away places. If we placed a rubber duck in a tiny stream, where will it go? I will float down the stream with the current and go into a larger stream or a river. The rubber duck will continue it's journey down the river to a larger river and eventually to an ocean. Once in the ocean, the rubber duck could end up landing at a coastline anywhere in the world, depending on the ocean currents and wind. It would be possible that if the rubber duck was placed in a tiny stream in Illinois, it could land on the coast of the continent of Africa. Meandering is the constant loops or bends in a river as opposed to flowing in a straight line. It would seem that the force of gravity would cause the river to run straight but there are other factors involved in a flowing river besides gravity. Sometimes a bend forms in the river because the land becomes more resistant to the flow, like rock. This sends the river into a different direction. There is also a natural vibration to water flow that will cause banks to erode and form new bends. Watch water flow down a car windshield. It will not usually flow straight, but in wiggles. River bends are also created when the scouring action of the water erodes a riverbank. The soil then gets deposited on the opposite side and builds up on the inside of the new band. This causes even more current (speed and direction of the water) to be pushed to the outside of the bend and it continues to grow into a large loop. Most American rivers were given names by the Native Americans with some being corrupted over the years to something different. One example is the Wabash River. It was originally called Wa-Bah-Shika, then the French Explorers called it Ouabache. River names originated from a local area so the names often do not reflect the true source and mouth of a river. The source is the beginning and the mouth is the end of a river. River distances are measured by the names they were given and not necessarily by their actual length. Following is an example of an interesting concept about river lengths. It is widely accepted that the Missouri River is the 15th longest river in the world. In the natural order of things it is actually the 3rd longest river in the world. The Missouri River headwaters (actual beginning of the river) is located in the Rocky Mountains and is called Hellroaring Creek. This Creek then becomes the Red Rock River. The Red Rock River flows into a large reservoir (lake with a dam). As the water flows over the reservoir dam it becomes Beaver Creek. When Beaver Creek joins the Big Hole River, the waterway becomes the Jefferson River. When the Jefferson is joined by the Madison and Gallatin Rivers it becomes the Missouri River. The Missouri River then flows for 2,341 miles to where it becomes the Mississippi River. It then flows another 1,106 miles to the Gulf of Mexico. If we visualize a drop of water falling into Hellroaring Creek and follow it, the drop would travel a total distance of 3,902 miles before ending up in the ocean. If this waterway had only one name from beginning to end it would then be the 3rd longest river in the world. The map below shows the river length from the mountains to the sea. We all own the rivers! In the United States most rivers are for public use and are not privately owned. The land along the rivers and even some islands may be private owned. Some smaller streams may be considered property of the landowner. Most states have lists of the waterways that are designated as public. In most cases the river shoreline is also for public use up to the high water mark. The high water mark is normally at a point where trees and grasses grow that cannot survive being submerged for long periods of time. This means during normal and low water, there is usually adequate land to access along the river. In some cases there are controversies between states with regard to water rights of a river, particularly when the river serves as a border between states. These tug-of-war issues must usually be settled in the courts. In addition to the water cycle mentioned earlier, rivers provide for a huge variety of wildlife and fish. Another important aspect of rivers is transportation. Rivers are like a watery highway and have been since Native Americans canoed great distances. It was much easier to travel and carry burdens on a river than to do so across the thick forests. We still use rivers for transportation from pleasure boats to commercial vessels. The United States has over 25,000 miles of navigable rivers. Navigable means that the river has a deep enough channel to operate commercial boats like tugboats and large cruisers. The 3.5 million miles of rivers in the United States play an important role in our commerce, recreation and ecology. What is the difference between a river and a creek? Rivers are generally regarded as being larger than a creek but there is no other difference with regard to their place in the water cycle, their meandering or their journey to the sea. Rivers are simply large creeks. There are many names for creeks that are given for various reasons. Those include brooks, streams, rivulets, runs, rills, licks and branches. Rivers have always flooded. It is a natural part of the river system. Rivers have floodplains. Floodplains are large areas of land along the rivers that flood during high water. The flood plains serve several purposes. The river replenishes the land with nutrients, helping plant life and crops grow. They also serve as release valves along the river bank to allow excess water to go where it will do no harm. Flood Plains also create wetlands for our wildlife. Over the years many of these flood plains have been cut-off with levees. Levees are large mounds of earth built along the shore to stop the river from flooding low lying areas. At right is a cut-away side view of a levee. Even though levees are designed to prevent flooding they actually create flooding in other areas. When levees are built, the natural flood plains are cut off and the excess water must go somewhere. The water will rise higher where the levee is built, then flood other areas that do not have high river banks. These areas may have not flooded before the levees were built but do now because of levees built elsewhere. We will never stop flooding on our rivers because that is what rivers do. What human intervention has done is to cause flooding to occur more often and at higher levels in places that did not used to flood, like our cities. It is ironic that the very structures that were built to prevent flooding actually play a part in causing them. This lesson has been learned on the lower Mississippi River where they have built spillways. Spillways are large gates that they can open to allow the floodwaters to flow into floodplains once again. Yes and No! Some of our rivers, particularly those flowing from mountains are quite clean. Other rivers have various concentrations of chemicals as a result of agricultural run-off (farm fields) and industry. Very often we see the brown waters of a river and may think that it is dirty but that is not always the case. Many rivers are alluvial. Alluvial means that they naturally carry sand and silt (soil). This is a natural process that creates a delta at the river's mouth. A delta is land that is formed by this material piling up at the end of a river, extending into the sea. Deltas provide great wetlands for wildlife. The good news is that our rivers are showing less content of pollutants each year. This is due to the efforts of government legislation (new laws), better farming practices to reduce run-off and many great organizations that have formed to clean up and prevent pollution. Are rivers safe to wade or swim? Some rivers have beaches or designated swimming areas that are safe when adults are present. Most rivers have characteristics that make them unsafe for swimming. The current in a river is usually stronger than it looks and a swimmer can be swept downstream. There is also debris (floating objects) in rivers that can be hazardous for swimmers. NEVER wade in a river. The current flows over submerged objects like sunken logs, creating a backwash on the downriver side of the object. The backwash digs a hole with steep sides. These holes are very dangerous. A riverbed can drop off to a very deep level very quickly, catching a wader off guard. Again..Never wade in a river! Why are dams built in rivers? 1. Lowhead Dams..This is the most common type of dam. They are designed to hold some water back in order to have deeper water above the dam. There is no control over how much water flows past the dam, since it spills over the top of the dam. Many of these dams were built in the days when mills operated on the rivers. The water passed through the dam in a flume (opening) and turned a large waterwheel that was connected to a grinding mill for making flour and other items from grain. They are also called grist mills. The illustration at right shows how the power of water is transferred to the grinding wheel. 2. Navigational Dams...These dams were built to keep deep water above each dam so that the channel (deepest part of the river) is suitable for commercial boats. They have locks that allow boats to pass through the change in water levels from above and below the dam. Locks on the river are like watery stairways and boats must be raised or lowered to the next level, depending on whether they are going upriver or downriver. Upriver boats will be raised and boats going downriver will be lowered. Shown at right is a vessel locking downriver. Notice that no pumps are used. Gravity fills and empties the lock chamber. 3. Hydroelectric Dams...These are usually higher dams that take advantage of the power created by water falling from above the dam to below the dam. Large turbines are installed in the path of the water. Turbines have fins inside of a tube that cause it to spin as the water passes through. This powers a generator that creates electricity. This method is much cleaner than coal-fired power plants. See the video below for more information about how hydroelectric plants work. 4. Flood Control Dams...Rivers often run through large valleys that can be several miles wide. When a dam is built the valley will fill with water. This is called a reservoir. The dam has control gates so that the amount of water passing through can be adjusted. This control allows the operators to keep the reservoir low in anticipation of rainy season or snow melt. When the river normally would flood, this valley will have enough capacity to hold the additional water and prevent downstream flooding. The dams are also used for holding water in reserve, so that during very low water some of it can be released downstream when it is needed. 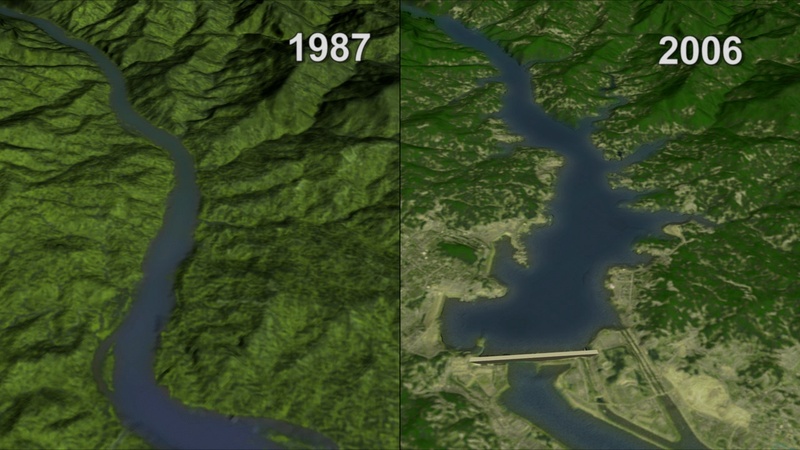 Another benefit to reservoirs is that they provide recreation opportunities like boating, swimming and fishing.The photo at right shows the natural river, then how it looked after a dam was built and the valley filled with water. Some dams like the Kentucky Dam on the Tennessee River perform several functions including navigation, electricity, flood control, recreation, drinking water and wildlife habitat. Other dams have out lived their purpose and been abandoned. When this happens they cause the river to become stagnant. Stagnation is when the river is no longer flowing as it should and silt builds up above the dam. There are organizations currently addressing this with a goal of removing some of the dams to allow the river to become free-flowing once again. Rivers have an amazing power of self-healing. Once a dam is removed or the point of pollution stops, the river will eventually clean itself and become restored to its original natural beauty. What are some historic American river journeys? There is no doubt the Lewis & Clark Expedition was the greatest river journey in history. Beginning in Pittsburgh, PA the Corp of Discover (their unofficial name) went down the Ohio River, then up the Mississippi River, then up the Missouri River to the headwaters. They then portaged the Rocky Mountains and found their way to the Snake River and Columbia River, then made it to the Pacific Ocean. Their discoveries, maps and journals changed America forever. In 1869 Civil War veteran Major John Wesley Powell and his men went over 1,000 miles down the treacherous Colorado River. They discovered many unknown aspects of the river and mapped it for future travelers. Their journey through the Grand Canyon provided much new information about this National Landmark. Powell later became director of the United States Geographic Survey. Robert La Salle was a French explorer who traveled the Great Lakes to the Mississippi River and became the first European to explore the Mississippi River all the way to the Gulf of Mexico in 1682. Even though his mission was to establish fur-trade routes along the river and he claimed the Mississippi River for France, his explorations opened the door to a greater understanding of the river for future travelers of the waterway that would eventually become part of the United States. We should embrace our rivers for their beauty and value, while protecting them for future generations. There are many river and watershed organizations taking part in cleanups and activism that helps to protect our rivers against pollution and exploitation. Get to know your local watershed and join us in our efforts to create public awareness of these valuable resources; our rivers. After reading this and discovering even more about our rivers, you will see the river differently while crossing a bridge. You will understand what it is like "Beyond the Bridges".